How to make chewing gum from pine sap and stun dogfish with a spring. 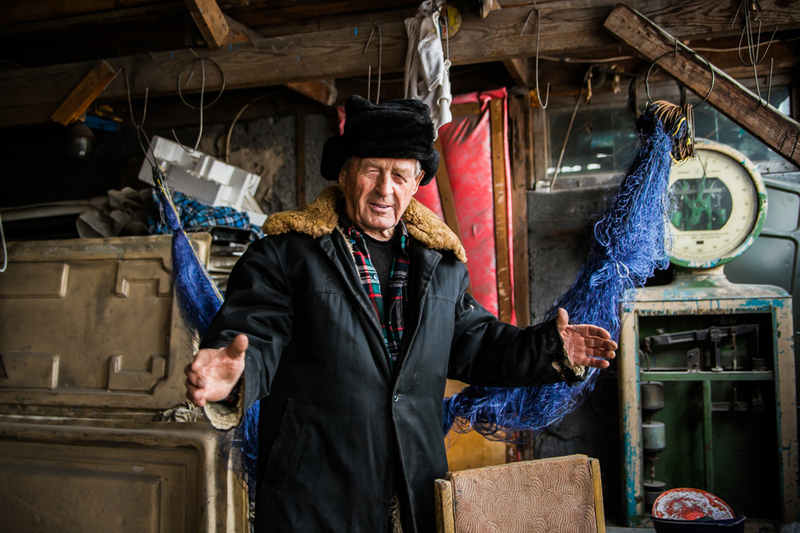 In Khakassia, a region of Russia in the south of Siberia, one out of ten locals from age 18 to 80 makes his or her living by selling natural resources. Hunting and fishing, along with harvesting of berries, medicinal herbs and cedar nuts, provide extra food and income for local families. A seasonal worker can make up to 100,000 rubles ($1675) in cash over six months of intensive labor. The monthly cost of living in Khakassia for a family of three is under 20,000 rubles ($335), so the money earned during the season is enough to get a family through the winter. I've been roaming the taiga for 20 years. I learned to harvest cones from the Shors in Kemerovo Region, where I tried gathering cedar nuts for the first time. Now I'm in charge of a team of locals. Jobs are scarce in villages, and I pay in cash on a daily basis. A worker earns 3000 rubles a day ($50), if he works hard. This way, people can put aside some money to support their families through the winter. I can't complain either: I’ve bought a house and a car, and I’m going to build a warehouse soon. Cedar-nut season is from October to December, depending on the temperatures and the yield. Harvesters start by picking up cones which have fallen to the ground. When there are no more fallen cones, harvesters take a long wooden staff, wrap one end in a piece of cloth and hit cedar trunks with it. The ripe cones fall to the ground, while the green ones are left to ripen. In the old days, cones were threshed with flails, after which the mass was sifted for nuts. Today harvesters make use of special machines powered by diesel generators. The equipment speeds up the cone processing and improves the quality of the end product. An average team of five harvesters yields five tons of nuts per season. The price for nuts depends on the crop. Over the previous four years, nut crops were poor and prices went up. We sold nuts at 350 rubles a kilo ($6). This year there’s a good harvest, so the same amount sells for 150 rubles ($2.5). People buy a lot; we have a local tradition of cracking the nuts with our teeth, like Russians do with sunflower seeds. Cedar nuts are also used for infusions and healing decoctions. I gather berries and sell them at the market. Some people I know live in villages far away and gather all sorts of natural resources, and they sell their berries through me: It is easier and more profitable to deal through an intermediary than to travel 200 kilometers to the city market. The harvesting season starts in May. Wild garlic is the earliest crop, followed by honeysuckle in June, first in Askiz District and in the mountains along the Khakassia–Tuva border. Summers are warmer there, so the earliest berries come from that region. In July, the wild strawberries are ready for harvesting, in August we harvest bog bilberries and blueberries, while the lingonberries aren’t ready until September. Not only do Siberians eat forest berries, but they also make use of their medicinal properties: Lingonberries are considered to be a natural antibiotic and cranberries are good for people with heart conditions, while blueberries are beneficial for people with bad eyesight. Wild garlic is the best remedy for spring avitaminosis. It is preserved in jars for the winter, salted and pickled as a spicy starter. We make natural chewing gum from cedar sap by dipping a piece of gauze into a pot with boiling sap, and the gauze absorbs the foam. When the sap thickens, the gum is ready. Strips of cedar gum help prevent various diseases of the mouth, as well as stomach conditions. I gather, dry and sell medicinal herbs. As soon as the herbs come into bloom, my grandson and I set out for the taiga. Herbalists gather plants only when the moon is waxing, when they have accumulated the most healing properties, and dry them in a dark, dry place. Mass harvesting takes place from June to the end of July. Sometimes Old Believers come out of the taiga and sell rare herbs which are hard to find near cities. Iceland moss is a popular commodity in cold weather. It’s a natural antibiotic used to treat lung diseases and colds. Creeping thyme is also popular: The locals believe that it can cure 35 diseases. People buy highland juniper, which is used by the locals to smoke their homes to keep evil spirits away. Juniper brew is also used to treat children when they have hysterical fits. The most valued herbs are clustered rhodiola and sweetvetch. These herbs grow only in Khakassia and Altai. Clustered rhodiola helps with tumors and gynecological conditions; it also boosts your immune system. Sweetvetch is believed to possess life-prolonging properties. Khakassians say that the best herbs are sold in the settlement of Tanzybei, 151 kilometers from Abakan along Road M54. Local sellers sometimes have rare species to offer, such as sagan-dale, which grows only in Siberia and the Tibetan foothills. This strong tonic is cheaper here than if you buy it from dealers. I was born with a fishing rod in my hands: My entire life has been linked to fishing. During World War II, we had food shortages and my grand-uncle organized fishing in the Yenisei channels to feed the settlement. Kids went fishing too; they did all they could to help the adults, as it was a hard time for everyone. Once, my brother and I caught a 30-kilogram dogfish. In autumn, the Yenisei is full of slush ice rising from the riverbed; it scares the fish away, and the dogfish go to places where the river has frozen. We put a tractor spring on a long wooden staff and beat it against the ice. This stunned the dogfish, and all you had to do was to take an ax, chop a hole in the ice, and pull the fish out. The best time for fishing on the Yenisei is from June 5 to June 19. That’s when the common and the crucian carps start spawning, and you can go fishing with a rod. April is the best time for ice fishing. Once in the spring, I caught so many roach that my horse could barely pull the sledge. The Yenisei and the Krasnoyarsk Reservoir are home to common carp, perch, roach, bream and peled. The grayling lives in small taiga rivers, and many people spend weeks looking for it because this species has become rare in Khakassia. Fishermen rarely sell fish: The catch is divided among family and neighbors to save money on food. However, sometimes the catch is so big that it is impossible to carry. In that case, the fisherman stands by the road and sells fresh fish at one-third its market price. This is not a stable source of income, but sometimes you can make a bundle. I once sold enough bream to buy a cow.